It’s a Friday morning in the fall. The air is crisp, the sun is slowly rising and the morning commute has started making its way into Uptown Charlotte for the final day of the work week. North Tryon is already a hustle and bustle as morning patrons stroll the street with their morning coffee, their phones glued to their ears, going about their morning as they do always. But, this is not a normal Friday morning. Bystanders stop and stare, give the second glance back to the street as they see a subtle shift in their city’s streetscape: where once a parking space had lived, little parklets are in process of being put together. Today is PARK(ing) Day. PARK(ing) Day is an annual worldwide event where artists, designers and citizens transform metered parking spots into temporary public parks. The project began in 2005 when Rebar, a San Francisco art and design studio, converted a single metered parking space into a temporary public park in downtown San Francisco. The mission of PARK(ing) Day is to call attention to the need for more urban open space, to generate critical debate around how public space is created and allocated, and to improve the quality of urban human habitat … at least until the meter runs out! The Charlotte LandDesign office teamed up with 505Design and Metrolina Landscapes to create our parklet. The setup crew began at 7 a.m., delivering four truckloads of supplies and team volunteers to setup shop between 6th and 7th Street on North Tryon, across from Duckworth’s Grill & Taphouse. With the platform in place, our team quickly devised a strategy to lay the pavers and prop the “Park” spray-painted palettes on the back wall. Even the crew from Metrolina was impressed with our brick laying abilities! With a plethora of plantings, our once bland parking space transformed into an active urban plaza, fully equipped with vibrantly colored site furnishings from LandDesign and 505’s offices. The addition of an oversized Instagram picture frame and a palette-turned-chalkboard element allowed bystanders to socially engage in our space beyond just occupying and observing. The parklet was active throughout the day, as various employees volunteered their time as site ambassadors, answering questions to the public and monitoring the space from 10 a.m. to 4 p.m. The team received a lot of great feedback and compliments; several people mentioned they saw our parklet photos on various social media platforms and that incentivized them to come check out the space. Others were just walking by, not aware about PARK(ing) Day and eager to find out more. The judges stopped by after lunch, as we were the sixth and final parklet in the competition. They were impressed by the juxtaposition of industrial contemporary character of the palettes and vibrant color furnishings, with the traditional pavers and soft addition of plantings. They appreciated the use of pavers, as opposed to faux grass, as it provided a sense of richness and thought to materiality. The judges had fun with the social media/community activism piece, as they each stopped to take their photo and write a message on the chalk board. Lastly, the judges appreciated the character and mood of our space, as our site was fortunately nestled under the tree foliage for most of the day, providing a comfortable, cool place to spend time outdoors. In the end, the judges chose the team from Stantec | Neighboring Concepts | We Love CLT as the winner of the Best Parklet Competition. Although we would have loved to win, it was great to see so many companies advocating this cause and creating awareness for the mission of PARK(ing) Day. The mission of PARK(ing) Day is to not only re-think the use of public space but to imagine how we can creatively re-purpose materials for these places. As we reflected on our parklet from 2014, the decision was made to minimize our impact on creating additional waste, and think of creative ways we could re-use things we routinely collect or throw out around the office. This instigated the great printer tube collection of 2015: a joint effort between LandDesign and our printing partners at ABC Printing. As months passed and tubes began to accumulate, we realized that there is a fine line between collecting a few tubes for their creative re-use and that abrupt moment when you realize you’ve accumulated hundreds of printer tubes. One thing led to another and the next thing we knew we had HUNDREDS of tubes piling up in our office with PARK(ing) Day only weeks away. How many tubes is too many tubes? What would we actually do with these tubes? The next logical step was to brainstorm all of the fun, crazy ways that we could re-use the tubes. We had ideas and models that transformed the tubes into planter walls, rocking chairs, ring-toss games and even musical instruments! We ultimately decided that we wanted to take this seemingly utilitarian object, the printing tube, and create a bold and artful piece of furniture. The structure itself would only use two simple materials, printing tubes and paper clips, allowing the assembly of the tubes and clips to be the focal element that ultimately eludes to the construction and materiality of the design. On the day of construction- we went back and forth on the best method of construction and eventually decided that using paper clips was, surprisingly, the strongest and fastest method to secure the tubes to one another. Five hours later as we clipped the last tubes together with blistered fingers, we saw the chair really come together. Early Saturday morning, there was a great group effort to get everything mobilized and to our spot in front of Raul’s Menswear on King Street in Old Town Alexandria. A quick assessment showed us that in several truck loads all of our elements would be moved to the site. Rolling out the carpet of green turf quickly claimed the parking space. The tube furniture being constructed in modular sections allowed us to quickly organize our parklet. The final touches came with the last truck load of plants lent to us by KT Enterprise, social media signs and lots of cushions. Everyone enjoyed spending a beautiful day visiting the LandDesign Park on King Street in Old Town Alexandria. Visitors stopped by to lounge in our modular seating structure, eat lunch, take pictures and ask us questions about how we collected so many tubes. It was great to get out of the office for an hour or two, enjoy the weather and have conversations with inquisitive tourists and locals alike. As landscape architects, we have a responsibility to not only think creatively about the built environment but how to do so in an environmentally-conscious way. It was apparent this year that by reducing the labor and waste of our design, the overall experience felt that much more rewarding. Pedestrians passing by were not only in awe but also inspired by the simple ingenuity of our parklet and how we used materials in an eco-friendly way. 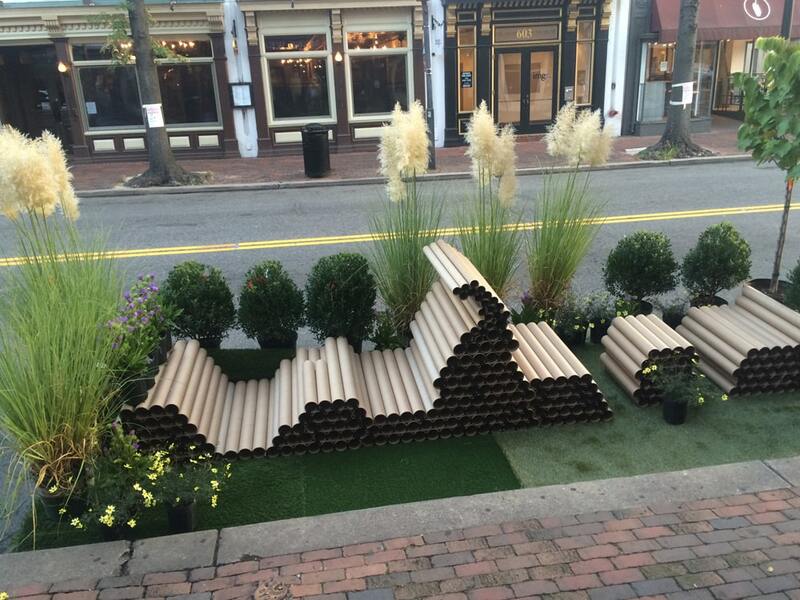 As we packed up our parklet and moved back into our normal grind, it is nice to have our 2015 PARK(ing) Day remind us of the important (and fun) role landscape architects have in informing and influencing the public (design) realm.